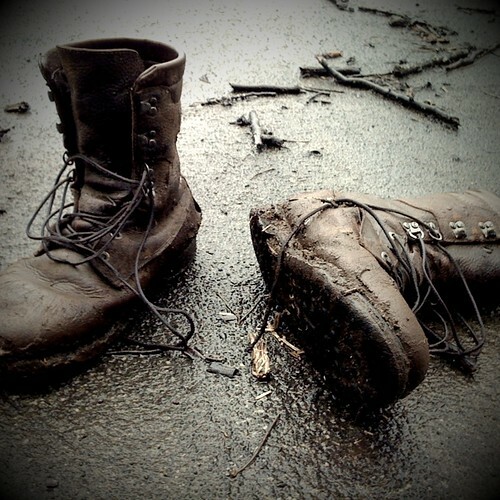 Abandoned Boots, originally uploaded by Eric Jeschke. Taken with the iPhone and CameraBag s/w. Eric, I like the look of this photo. I’m really amazed at some of the photos that are being produced with iPhones these days. It argues against any need for super high pixel resolution, at least for the web, doesn’t it. Well done! Earl, sometimes that’s the only camera I have with me. It’s fun for a toy camera type look, which is what the CameraBag app does. This is the “Helga” (Holga) treatment. Another neat feature is the ability to upload to Flickr and post to the blog directly from the phone. As for downsides: I don’t care so much about the noise, but the resolution and dynamic range are rather poor, at least in the 2nd gen iPhone that I have. Also, controls are near non-existent. For my next phone I’ll be looking for a better built in camera, to be sure. Never thought that would be a any kind of phone buying issue for me, but it really opens up a lot of possibilities when you don’t have your regular gear with you.